DeKalb, Illinois is a city of over 43,000 population located 60 miles west of Chicago, Illinois. It enjoys a quiet atmosphere in the country while only an hour's drive from one of the largest urban areas in the United States. DeKalb is located at 41�'53" North, 88�'1" West (41.931274, -88.750151). According to the U.S. Census Bureau, the city covers a total area of 12.6 square miles (32.7 km�). DeKalb is home to major facilities of several Fortune 500 companies such as 3M, General Electric, Goodyear, Nestle, and Target. DeKalb was first settled in the 1830's being known as Huntly's Grove and Buena Vista. It was officially incorporated as the city of DeKalb in 1856. A large bicentennial celebration was held in 2006. DeKalb has long been a center for agriculture (click here). DeKalb County is a leader in corn, soy bean, and hog production. It was in DeKalb that Joseph Glidden invented barbed wire in 1874, which developed DeKalb into the nation's major manufacturing center of barbed wire. DeKalb became known as the "Barb City". DeKalb's Henry Gurler developed a process for purifying milk ahead of Louis Pasteur. Jacob Haish one of the manufacturers of barbed wire began the Jacob Haish Manufacturing Company which also produced gasoline engines, manure spreaders, cream separators, and several other products. Click here for more information. For the souvenir edition of the DeKalb Chronicle from Saturday, January 9, 1892, Click here. For a photo record of the construction of DeKalb's historic 1905 Post Office (torn down in 1995), Click here. DeKalb was home to the nation's first county farm bureau and was a center for genetics research with DeKalb Genetics, which was later acquired by Monsanto. 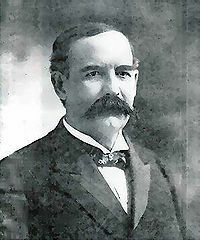 Thomas Roberts Sr and Charlie Gunn were the pioneers of hybrid seed corn. Del Monte operated a major processing center for canning corn and peas. DeKalb Feeds were milled and Caterpillar Challenger agricultural tractors were manufactured in DeKalb. The Melvin Clark Piano company had a large plant in DeKalb which was eventually purchased by the Wurlitzer Company in 1919. In 1935 Wulitzer moved its headquarters to DeKalb, and made it the only manufacturing plant in the world producing their famous pianos. The plant closed in the 1970s, and they moved their corporate headquarters to Gurler Rd. At that location they assembled the mightiest Wurlitzer organ in the world. Mightiest Wurlitzer Organ Melvin Clark Piano Co.
Click here for an excerpt from the DeKalb Centennial Volume published in 1956. Many immigrant groups were influential in the community, click here for a history of DeKalb's finnish community. Traveling through the USA, it's hard to avoid a connection with DeKalb. You see miles of barbed wire, the famous winged ear signs of DeKalb hybrids along highways, or Caterpillar's Challenger tractors working in fields, all these products at one time called DeKalb, Illinois their home. Those giant blue Harvestore silos dotting the landscape continue to be manufactured in DeKalb. 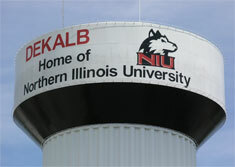 As a center for education DeKalb is home to Northern Illinois University (Illinois' 2nd largest university campus with over 25,000 students). Visit their website for more detailed information. Only 10 minutes away is Kishwaukee College, an outstanding two year community college. DeKalb is named for General Baron Johan DeKalb. DeKalb came with Lafayette from France to serve in the Revolutionary War against the British. He served under General George Washington at Valley Forge where he was a trusted officer and friend. He fought in several battles leading the Maryland and Delaware Continentals. His last battle against British troops took place in Camden, South Carolina. It was in this battle at Camden that General DeKalb died after being wounded 11 times during a valient effort on August 19, 1780. Restored in 1983 to its original brilliance, the Egyptian Theatre, a world-famous 1929 movie palace, is among DeKalb's architectural crown jewels. The 1,483-seat theatre is open to the public about 150 days a year. The Art Deco movie palace is operated and staffed by the volunteer group, P.E.T. Inc. (Preservation of the Egyptian Theatre). 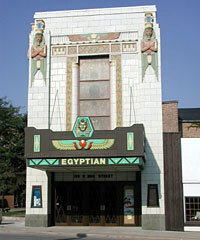 Listed on the Registry of Historic Places, the Egyptian is home to 20+ local performing arts groups and shows movies (the art, independent and foreign films). The Egyptian is also available for rentals, tours, weddings, graduations, small parties and receptions. Telephone 815/758-1215. Historically, DeKalb is where barbed wire was invented, and home to the nation's first farm bureau. 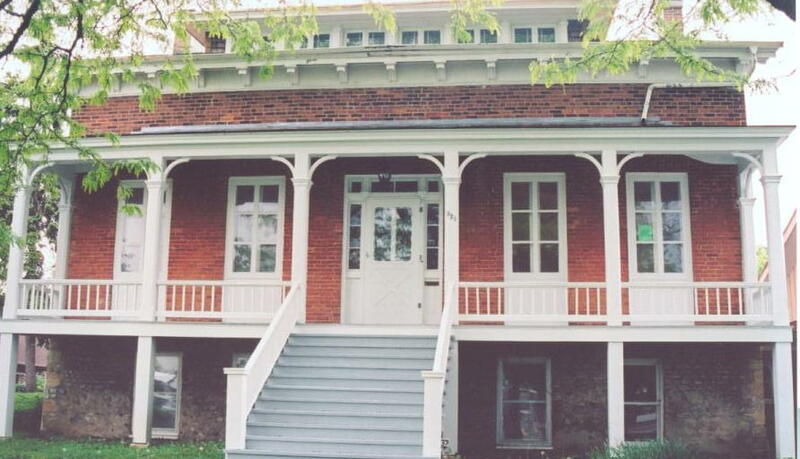 The Ellwood House Museum is a mansion built in 1879 by Isaac Ellwood, a leading manufacturer of barbed wire. The mansion is situated in a beautiful wooded park and a new education building has recently been constructed. Guided tours are Tuesday through Friday at 1:00pm and 3:00pm. Telephone 815/756-4609. Joseph Farwell Glidden's invention of one of the most widely-used types of barbed wire in 1873, helped change the history of the American West and had far-reaching impact throughout the world. 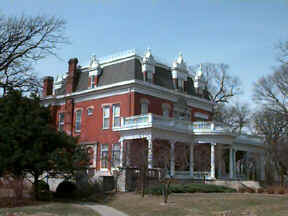 Glidden invented "The Winner" (patented Nov. 24, 1874) at the DeKalb, IL, home he built in the 1860s. 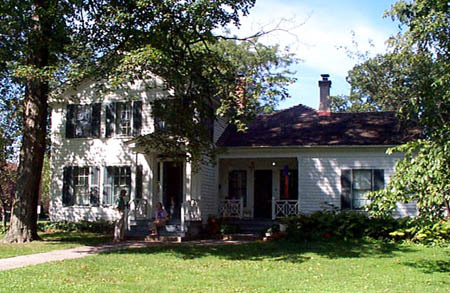 The non-profit organization known as the Joseph F. Glidden Homestead & Historical Center was founded in 1995, to restore and preserve the Homestead's buildings. It is a 501(c)3 organization. Home of Henry B. Gurler, a pioneer in modern dairy science, and owner of a dairy and several creamaries in the area. Henry received a gold medal at the 1900 Paris Exposition for his innovations of clean milk and cold storage which kept his milk pure after 17 days and 4,000 miles of travel. Gurler House Museum is located at 205 Pine Street in DeKalb. 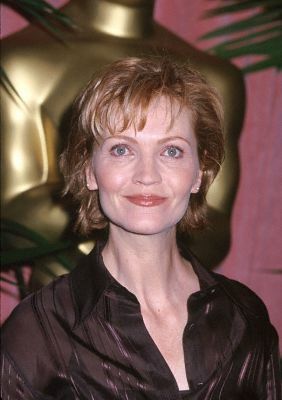 Joan Allen is an award winning actress, star of stage and screen. She grew up in nearby Rochelle, Illinois and attended Northern Illinois University in DeKalb. She became a member of the Steppenwolf Theatre Company of Chicago with fellow actors John Malkovich and Gary Sinise. Three times she has been an Academy Award nominee for her performances in "Nixon", "The Crucible" and "The Contender", Joan is one of the most successful alumni from Northern Illinois University's School of Theater and Dance. Click here for more information. Dan has performed on stage and television, including Chicago's Second City comedy troup. 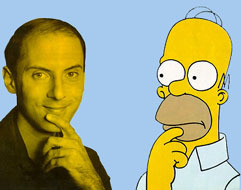 He is, of course, most famous for being the voice of Homer Simpson. Dan is an alumni of the School of Theatre and Dance at Northern Illinois University. No doubt the time he spent in DeKalb had an affect on him. Click here for an interview. Check out his new book by clicking here. And yes, Cindy Crawford did grow up in the city of DeKalb. She did some modeling while in high school, and gave up an engineering scholarship at Northwestern University to pursue modeling full time. What kind of student was she? Cindy had a perfect 4.0 grade point average during her high school career, graduating #1 and valadictorian of the class of 1984. She is as bright as she is beautiful. 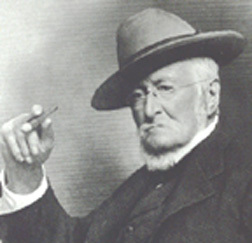 Isaac Ellwood arrived in DeKalb in 1855. He bought a hardware store and after the Civil War raised Percheron draft horses on his 3400 acre DeKalb ranch. He became interested in barbed wire, buying half interest in the Glidden patent, built a factory, built the business to financial success and sold out to American Steel & Wire Corporation in 1898. Ellwood had 395,000 acres of ranching interests in Texas, helped establish the university at DeKalb, and served on the Governor's Staff. He died September 11, 1910 at age 77. For more information on Ellwood click here. 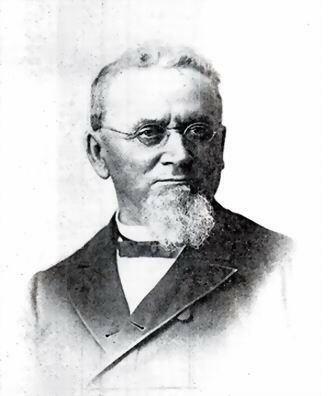 Joseph Falwell Glidden moved to DeKalb in 1843 at age 30 and bought a farm. In 1873 at age 60 he invented barbed wire. In 1874, he sold half interest to Isaac Ellwood and they built a factory in downtown DeKalb. Glidden also owned a large farm, 355,000 acres in Texas, Glidden House Hotel, DeKalb National Bank, DeKalb Daily Chronicle newspaper, a rolling mill, and other business interests. He received many honors for his philanthropy and generosity. He worked with Ellwood and Haish to bring the university to DeKalb. Click here for more information about Joseph F. Glidden. DeKalb is also the birthplace of television celebrity Barbara Hale, known to millions as Della Street on the Perry Mason television series. She was born in DeKalb back in 1921. 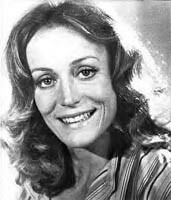 In addition to the Perry Mason series, she has made numerous other films in her long and distinguished movie career. Click here for more information. 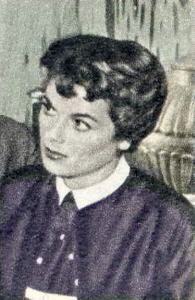 Click here to see her filmography. Steve played football for the NIU Huskies as a linebacker, ending his career after a torn ankle ligament. He earned a BA from the School of Theatre and Dance from Northern Illinois University and continued graduate work in Delaware, before going on to act in movies such as the "Mod Squad", "The Rock", "The Skulls", among others. 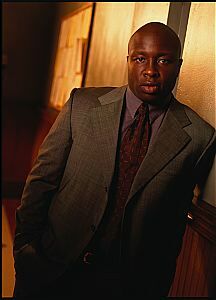 He is best known for his portrayal of attorney Eugene Young in the television program "The Practice". He recently costarred with Tom Cruise in the film, "Minority Report". Click here for more information. Dennis Hastert earned a Masters degree at Northern Illinois University. As a teacher and wrestling coach for Yorkville High School, he also spent some time with his wrestling team competing in DeKalb. Click here to visit his official website. Mikie Heimerdinger grew up in DeKalb and played football at DeKalb High School, class of 1971. In college he played at Eastern Illinois University. 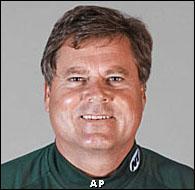 He coached college football at: Duke University, Rice University, Cal State Fullerton, University of Florida, North Texas State, and the U.S. Air Force Academy. He coached NFL football at: Denver Broncos, New York Jets, and Tennessee Titans. Click Here for more information. Actor Richard Jenkins was born and grew up in DeKalb. 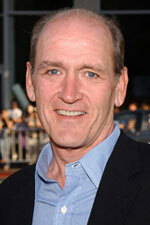 Richard Jenkins has had a long and prolific career playing as a character actor in over 75 film productions. Recently he played the father in "Step Brothers" and had the starring role in "The Visitor" for which he won an Oscar nomination. He is also well known as the patriarch in HBO's "Six Feet Under". Click here to see his filmography. DeKalb was the birthplace of Charles Nash, industrialist who once headed the Buick Motor Company, later head of General Motors, and founder of the Nash Motor Company. He was born in DeKalb on January 28, 1864. Read more about him by clicking here. Richard graduated from DeKalb High School in 1975. During his career he has taken the literary world by storm. He was elected a Fellow of the American Academy of Arts and Sciences in 1998. Powers has been awarded a MacArthur Fellow (1989), Lannan Literary Award (1999), named one of five "Writers of the Decade" by Esquire magazine. Other awards include the Corrington Award for Literary Excellence (2001), Dos Passos Prize For Literature (2003), National Book Award for Fiction (2006), Finalist, Pulitzer Prize for Fiction (2006). Named in 1996 to University of Illinois's endowed Swanlund Chair in English and appointed to the Center for Advanced Study (1999), Powers continues to write, teach, and travel. Click here for a more complete biography. Bruce Joel Rubin taught english classes while doing graduate work at Northern Illinois University. He is probably better known to the world for his writing skills. Screenplays have included; Brainstorm, Jacob's Ladder, Ghost, My Life, Deep Impact, and Stuart Little 2. His screenplay for "Ghost" won the Academy Award in 1990. He is also remembered locally as a volunteer who served as Cubmaster of Cub Scout Pack 131 while his son was a student at Lincoln School. Click here for a more complete biography. Paul studied Art and Biology as an undergrad at NIU. He went on to become a professor at the Univeristy of Chicago and co-founder of Project Discovery. 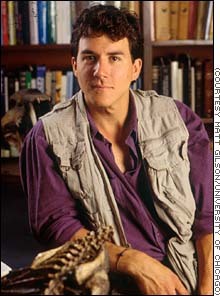 Through his expeditions he has discovered 7 new species of dinosaurs and has earned the nickname "Dinosaur Hunter". Click here for a more complete biogaphy. Carrie Snodgrass studied drama at NIU in DeKalb, later studying drama at the Goodman Theatre in Chicago. Her first film appearance was in "Easy Rider". She is probably best known for her starring role in "Diary of a Mad Housewife" as well as "Rabbit Run", "Blue Sky" and costared opposite Clint Eastwood in "Pale Rider". She and Neil Young had a son together, Zeke, born with Cerebral Palsy. She died in 2004. Click here for more information. 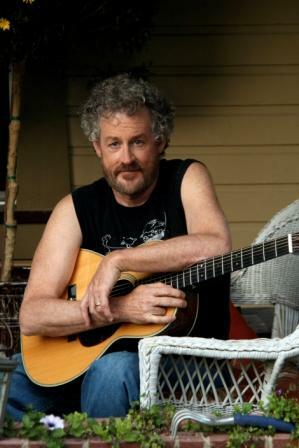 Emmy winning songwriter, cartoonist, writer, musician, professor. Dave Williams spent his youth growing up in DeKalb. His cartoons appear through Carlton Cards and Soultrader of London. 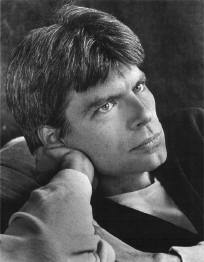 He's published books with Alfred A. Knopf and Ghost Road Press, as well as short stories and poems. Holding a Ph.D. in English, he's served as "Writer in Residence" at colleges and universities. He has written and recorded ALA and NAPPA award-winning albums for children. He is songwriter for the new PBS children抯 show "The Big Green Rabbit", for which he won an Emmy in 2009. His songs on youtube have over 30 million hits. 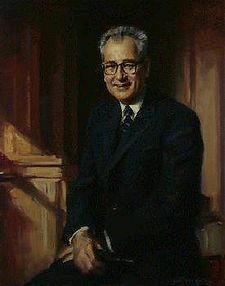 William Willard Wirtz: March 14, 1914 - April 24, 2010. He was born and raised in DeKalb, Illinois. He attended DeKalb Township High School, Northern Illinois University, Beloit College and later graduated from Harvard Law School. He served on the faculty of the University of Iowa and Northwestern University. He was named Secretary of Labor by President John F. Kennedy and served in that capacity under President Lyndon B. Johnson. Click here for more information. Robert Zemeckis was a student at Northern Illinois University before moving on to USC. Some of his more famous films include; Tales From the Crypt, Back to the Future trilogy, Romancing the Stone, Who Framed Roger Rabbit, Forrest Gump, What Lies Beneath, and Cast Away. For a detailed biography click here.